The Old Cabbagetown Tree Lot. 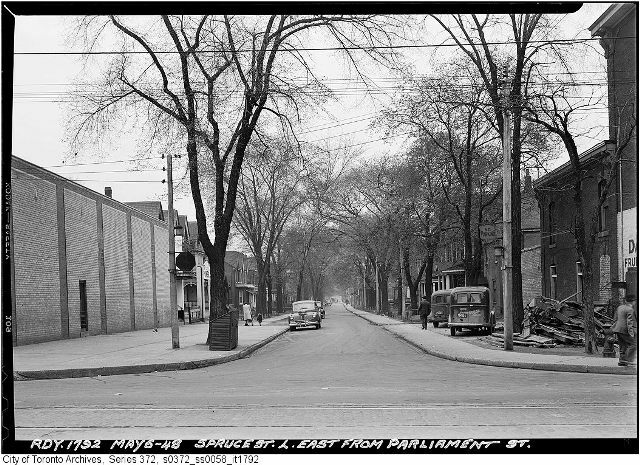 In 1952 Louis St. Laurent was PM, Toronto got its first television station, Leafs games aired on Hockey Night in Canada for the first time and Gerry McDermott, an ambitious 20-year-old apprentice electrician, began selling Christmas trees at the corner of Spruce and Parliament Streets. St. Laurent died and the Gardens became a grocery store but McDermott’s unadorned tree lot continues selling Fraser firs on the same Cabbagetown street corner, a neighbourhood institution for over 60 years. A year into renting sidewalk space from the Power supermarket at 449 Parliament St. Gerry’s younger brother Dale and their father Elmer joined Gerry in his fledging venture. Responsibilities were assigned. Gerry and Dale preferred the operational side of business, growing, pruning and harvesting trees. Elmer tried his hand at sales. To Gerry’s delight his father, blessed with the gift of gab, was a natural salesman. Spruce Street at Parliament showing tree lot today. Elmer returned to the tree lot every December until 1996 when he died at the age of 91. In the early days the McDermott lot sold a wide selection of trees including spruce, Scotch pine and juniper grown on the family’s 6,000 acre tree nursery north of Bracebridge. Early success led to additional lots around Toronto, in North York and Mississauga. Eventually the acreage was sold and all but one of the lots shuttered. The last remaining lot in Cabbagetown sells only Fraser firs harvested from a nursery north of Barrie. Today 80-year-old Dale continues to help where he can before leaving to winter in Florida. The bulk of responsibility falls to 83-year-old Gerry and Peter Vettorel, a congenial electrician who joined the operation three decades ago. On the final weekend in November Gerry and Peter make the three-hour drive in from Bracebridge with a dilapidated aluminium trailer, a stack of firs and other necessities in tow. 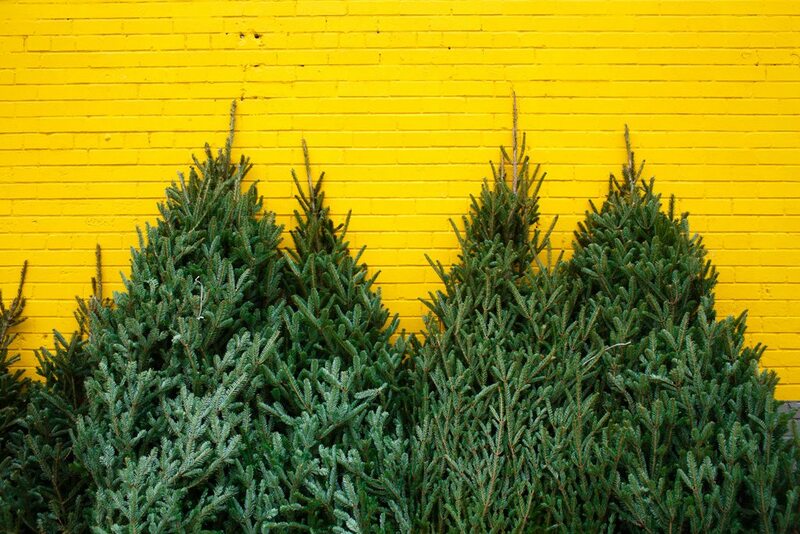 Trees are unbound, shaken and then placed in stands or propped against the yellow and white brick wall on the south side of Cosimo’s No Frills. Power is supplied by the discount grocery store. A string of temporary incandescent light bulbs are strung. The battered Golden Falcon trailer with a leaky roof is levelled and blocked. The trailer lacks running water and bathroom facilities. When set-up is complete the lot is anything but a winter wonderland. Decorations are limited to faded wooden Frosty and Santa cut-outs attached to a plywood shed. Passers-by periodically pick up the scent of a freshly cut firs. Gerry returns home to Bracebridge. Through December he’ll supply Peter with additional trees. Except for a day here and there, Peter will spend the next 26 days hunkered down at the lot. 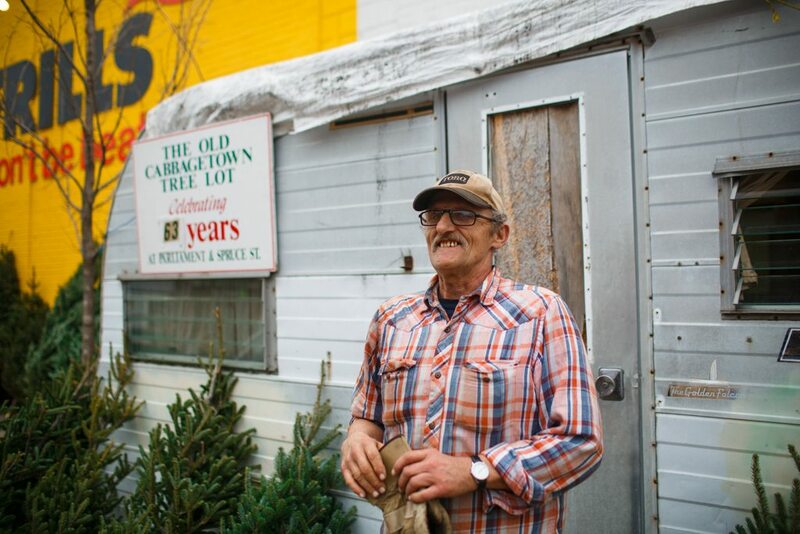 Peter Vettorel has been selling trees at The Old Cabbagetown Tree Lot since 1985. For 11 months of the year Peter is employed as an electrician in cottage country. It was through this work he started hawking trees in Toronto. Besides the Christmas tree enterprise the McDermotts also established the successful electrical company employing Peter. Dale asked if he would like to try his hand at manning a tree lot on Spruce Street. Figuring it could be no worse than camping, plus he’d be paid, Peter agreed. Even though he claims, “Sometimes an angry bear is easier to deal with than the people around here,” Peter has returned every year since 1985. The ramshackle trailer is almost as old as Peter. A tarp keeps precipitation out. Peter makes the best of his living conditions. There’s a small kitchenette, a space heater and a narrow bed too short for his six-foot frame. Between drunks stumbling past after last call, traffic, sirens, and delivery vehicles, sleep is at best fitful. A local diner provides bathroom facilities. Breakfast is at a restaurant across the street. The rest of his meals are from a nearby Subway Sandwich shop. After 63 years the lot is a Cabbagetown tradition. In the olden days trees sold for a two-dollar bill. Today they fetch upwards of a hundred dollars. Customers range from the well-heeled from Rosedale to residents of Cabbagetown’s many Victorian homes to individuals renting rooms by the week. A young woman carts her purchase away in a shopping cart but not before attempting to convince Peter to shave five dollars off a twenty-five dollar tree. Adversely, an elegant couple speeds off with a tree stuffed in the hatch of a BMW, tipping twenty for a forty-dollar fir. Reluctant to drop names, a goodly number of prominent citizens visit the lot. For years Peter has sold a tree to an individual at the head of a prominent communications company. Residing in a Rosedale mansion larger than the No Frills next to the tree lot, this individual showed up recently at closing time and purchased a fourteen-foot fir. Delivered to his home then decorated, he and his wife were unsatisfied with the tree’s appearance. The tree was un-decorated and returned. A second fir, to Peter’s eye identical to the first, was then purchased. Apologizing for their fastidiousness, Peter received a sizeable gratuity. Callused hands buried in his sap-stained trouser pockets, Peter reflects on changes in the community over the years. A few favourite restaurants have closed. Fewer drug addicts roaming area streets has meant less tree theft. Foot traffic has decreased. Today it’s not uncommon for a potential customer to cruise by the lot examining trees from the comfort of their car. If something catches their eye they’ll park. Fraser firs leaning against Cosimo’s No Frills. Peter expects to sell around five hundred trees this season. His days are long. Opening mid-morning, the lot won’t close until nine. During lulls Peter neatens up, rearranges trees, sweeps the side walk and takes a crack at a crossword puzzle. 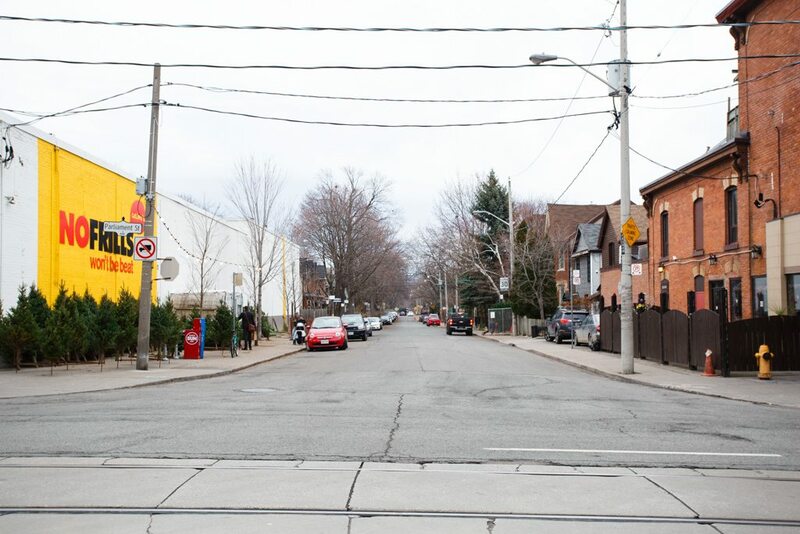 With the owner well past retirement age and no offspring to continue the tradition, what’s the future for the Cabbagetown lot? Peter shrugs. Gerry mentioned a nephew assuming control but Peter isn’t convinced this is the best route. The nephew is no spring chicken. 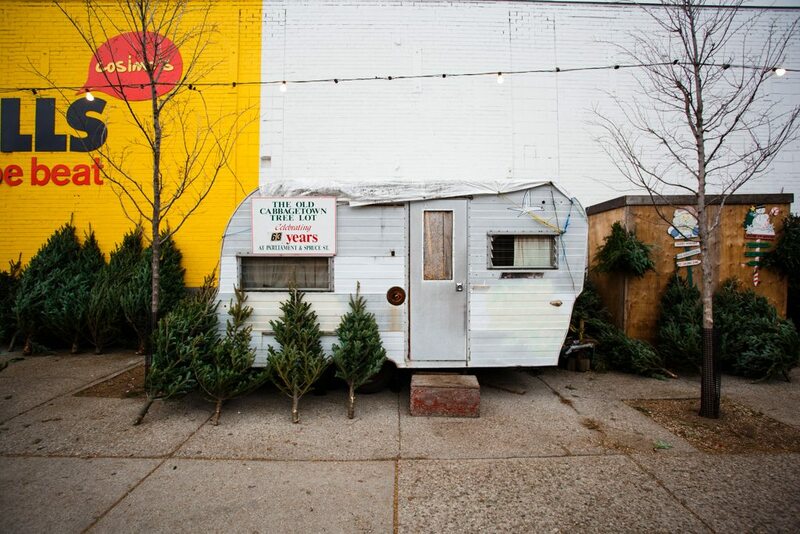 The Old Cabbagetown Tree Lot remains open until the evening of December 24.